We’re back at MD Anderson for the beginning of the end of her surgeries. There will be another surgery or two, but this is the last big one. She’s packed and ready. Note the prayer pillow that’s ready for her hospital stay. 5:35 a.m.: We were supposed to report at 6 a.m. It’s a two-minute drive from where we’re staying. I asked if Jenny filled out the online questionnaire she agreed to yesterday as part of a research study for her reconstruction. She agreed to the series of online surveys over the next two years. The first survey needed to be done before surgery. Jenny didn’t get to that last night. (I blame all the well-wishers on text and Facebook — but that was well worth it, of course. People really like her. She has a way of connecting with people. That makes me extremely happy.) As for the research study, she really wanted to be part of it to help similar patients in the future. So she races through the questions and we head out the door. 5:55 a.m.: We arrive at about the same time as all the other early surgical patients. It’s not a rowdy crowd. 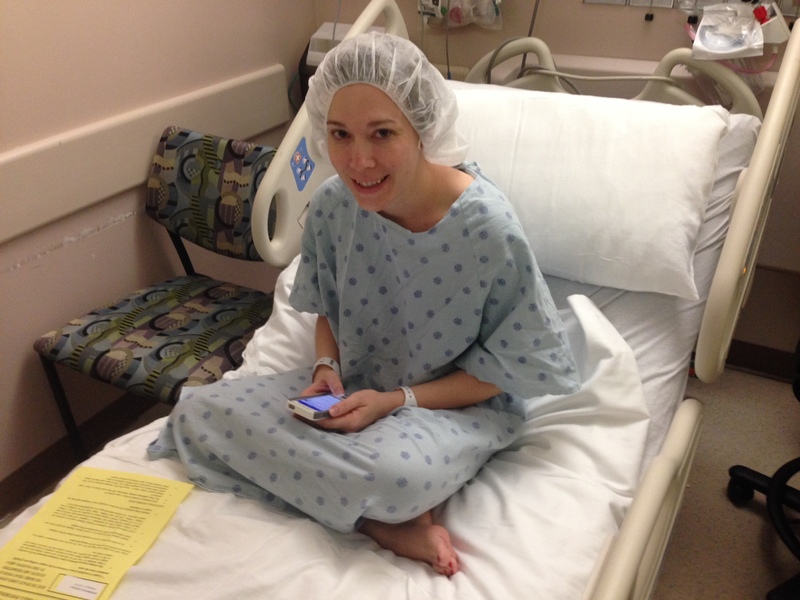 6:07 a.m.: Jenny is taken back to her pre-op room. There we wait for a nurse to go through the prepping process. We were last on the list, apparently. It seems like a long wait to get to see the nurse to get the process started. Jenny wants a blanket. She’s cold. Jenny gets a blanket — a heated one. That part is good. The comfort of the heated blankets almost make it worth the surgeries. She’s cold. She needs a blanket. 6:45 a.m.: Jenny’s parents, Bill and Linda, arrive. Only one person can be with Jenny at a time. That’s the rule. Linda goes back to see Jenny. 6:50 a.m.: Our pastor, Mark Foster, arrives. 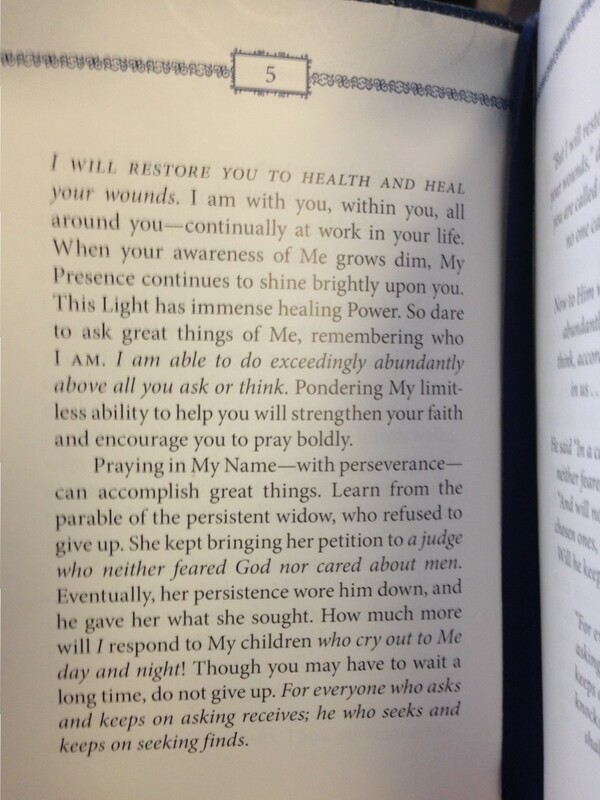 He shares a page from the book he’s reading, feeling like it’s perfect for us to see today. 7:05 a.m: Bill takes a turn to see Jenny. 7:15 a.m.: Mark sees her. He prays for her and shares the same page of the book he’s reading. 7:25 a.m.: We find our waiting area. I go back to be with Jenny as the anesthesiologist, Katie (Dr. Kronowitz’s PA) and Dr. DeSnyder stop by to see her. Jenny doesn’t feel good, but she’s not uneasy about the surgery. No crying. No nervousness to speak of. But … “I think I could throw up at any moment.” She’s had no caffeine or food yet. She’s ready for the meds. 7:50 a.m.: They wheel her back. She’s loopy now. “That’s my margherita,” she says. I get one last kiss. Now we wait. 8:27 a.m.: Dr. DeSnyder makes the first incision. I wasn’t there, I promise. 9:34 a.m.: My mother and father text well-wishes, including a recommended Bible verse — Eph 3:14-21. Coincidentally, it’s one of the verses from the writing Mark shared. Or maybe it wasn’t a coincidence. 10:35 a.m.: They get me again. Dr. DeSnyder was ready to see me. Her part of the surgery is finished. It went quicker than expected — just two hours. I asked if she rushed. She said no, perhaps missing my attempt at humor. She said Dr. Kronowitz is in the operating room now and will eventually put a tissue expander on the left side — the side Dr. DeSnyder was working on. 11:30 a.m.: Lunchtime. Mark and I go down to the Cafe Anderson on the first floor for a quick bite. Mark described yesterday that he merely is a representative of all the people in our Acts 2 community that love and care for us. We really appreciate that he, our church and our weekly Disciple I class sacrificed his time to be with us. 12:20 p.m.: Bill and Linda are in the waiting room for the every-two-hours update. The nurse said Jenny is still doing well and that Dr. Kronowitz and his team are working on the lat-flap procedure that was so scrutinized this week. This part will still take awhile. The nurse tells Bill and Linda that they will probably skip the 2 p.m. update because there’s likely not going to be anything new. 1:20 p.m.: My old friend, Trey Wirz, stopped by. Trey and his wife Melody live on the north side of Houston. We’ve stayed with their family on a number of occasions on our many trips to Houston. Trey was kind enough to stop by and share some old memories of college days and some of the fun we’ve had before and after Jenny came into my life. Also, through our discussions, I learned that the freshman Zoology class I took in college was unnecessary. What? I dropped that class twice before finally getting through it my final semester to ‘fulfill my requirement’ for my journalism degree. I remember it as being a big stress in my life and ultimately the most difficult class I took in college. I could have taken much easier classes, Trey said. “That’s the weed-out class for pre-med students,” he said. “You could have taken Geology.” Thanks Trey. I wish I had that information 20 years ago. 2:15 p.m.: The nurse comes by and gives us a 2 p.m. update after all. But they probably didn’t need to — there wasn’t much to update. The nurse says they are still working on the lat flap and haven’t gotten to the point of turning her over yet. It’s still going to be a long afternoon, it looks like. 4:20 p.m.: Time for a new update … the nurse this time does have some additional information. The lat flap is complete, and they are working on the implant on that side, but they haven’t started on the side of the new mastectomy yet. There’s no timetable for completion, but there is progress. That’s good. Since there’s no timetable, we make our own predictions. I predict 5:49 p.m. for them to come announce completion. Mark has 5:48 p.m. Linda goes with 5:45 p.m. Bill, ever the optimist, chooses 5:25 p.m.
4:55 p.m.: Bill was the closest! Dr. Kronowitz says the surgery is over. He says everything went well. He completed the lat flap, the fat grafting and the implant on the right side and the tissue expander on the left side. Jenny still has some time to spend in recovery before we can see her. As I sit and type this, I’m very relieved that this part is over. I was very confident that everything would be fine, and I know the recovery process will be difficult. But it feels like a victory. Remember, this is the last big surgery! 5:30 p.m.: Mark took this photo as a commemoration of celebration. 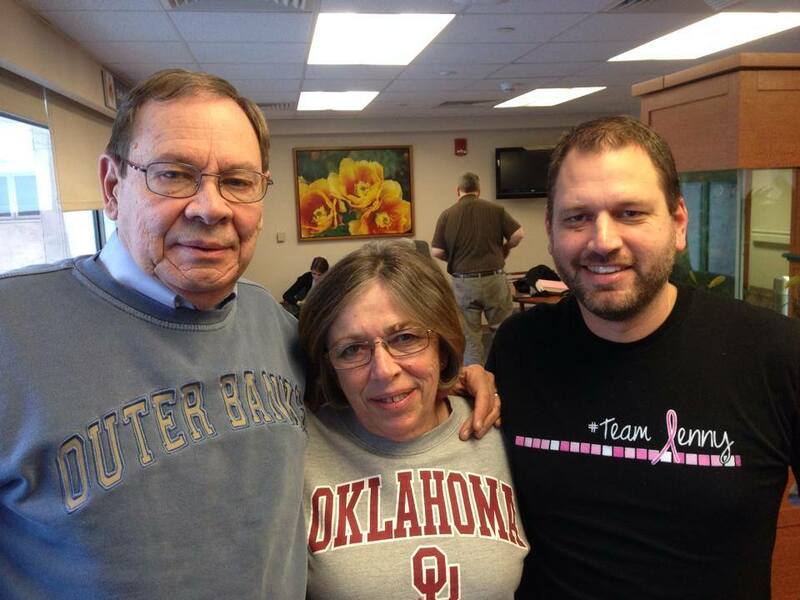 Bill and Linda are awesome and all, but I plan on not spending much more time in waiting rooms with them anymore. 6:49 p.m.: Still waiting. This is when I get antsy. I’m ready to see her. We all are. I’m sure it’s close now. 7:01 p.m.: Waiting room volunteer tells me the exact time of her arrival to the recovery room (5:53 p.m.) and to expect to wait anywhere between 1 more minute and 50 more minutes. 7:23 p.m.: And finally! They come get me. I get to go see her. She’s quite alert — but not exactly smiling. She is surprised to hear what time is — “It’s 7?! ?” She’s in pain, but has the morphine button in her hand, so that’s good. She tells a tale of frustration with the anesthesiologist (or the anesthesiologist’s helper) in the operating room when they woke her up. She couldn’t take a deep breath (probably the effect of the back muscle being moved, they say), but he was not sympathetic and just reported her oxygen levels. He then didn’t move very fast when she insisted she was going to throw up. She didn’t throw up, and he eventually left. That alone made her feel better. 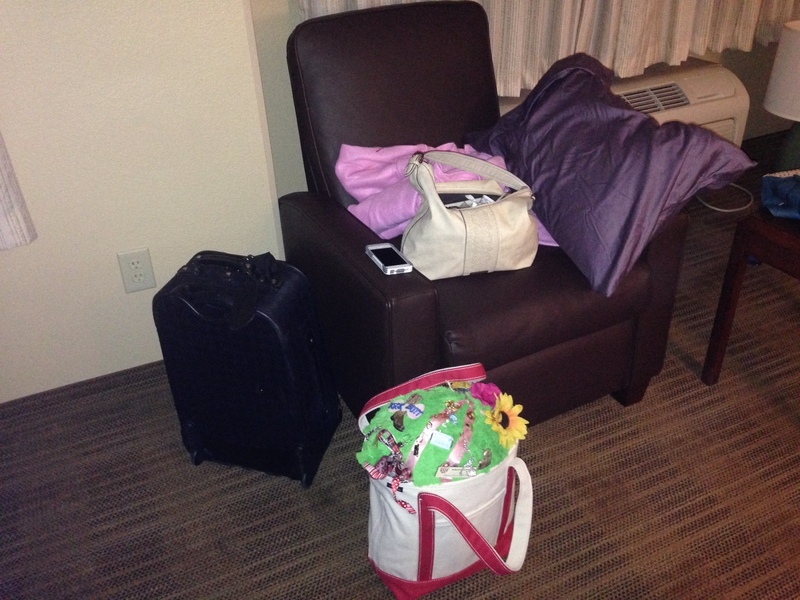 8:50 p.m.: They take Jenny to her room. She’s set for the night. Only ice chips to eat tonight, which seems fine with her. She’ll get clear liquids in the morning. That’s the plan. 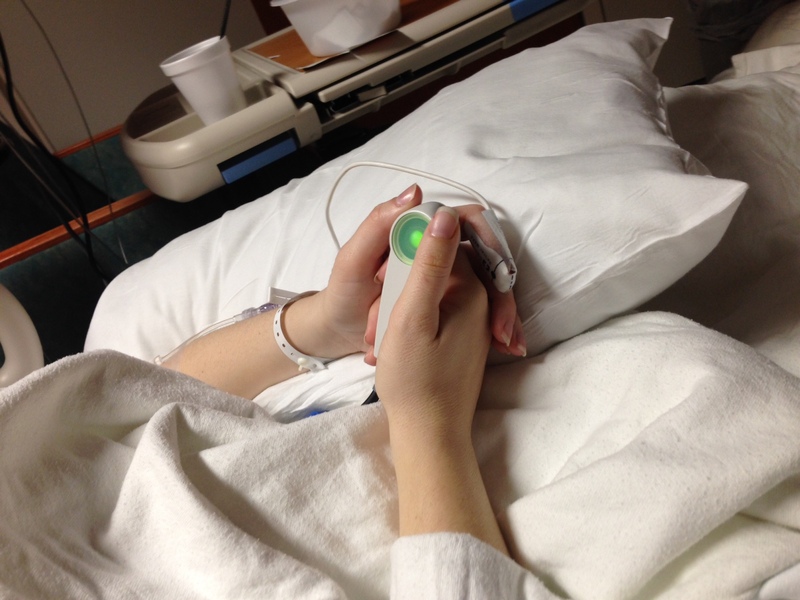 9:25 p.m.: For now, she spends her time waiting for the green light to appear on her morphine button. “C’mon morphine,” she says disappointingly as she looks down. Our only goal for the night is to get another way to get pain medication — a way that doesn’t require her to wake up every 10 minutes. Thanks for the update Alan. You are a good narrator. Give Jen hugs and kisses from the Starks! Phew. Love to you. Healing thoughts your way. Whew! Last big one is over!!! While we have the whole waiting room process down to a science with Alan, we agree. Let’s make this the last time we spend the day hanging out waiting for updates! Thanks so much to Mark for being here. Your presence was very much appreciated, Mark! Trey, it was good to see you again. We enjoyed the stories. And a huge thank you to all the friends & family who have so steadfastly supported Jen with their prayers & countless acts of kindness. All that has so helped to keep the healing momentum moving forward on a positive note. THANK YOU for being there for her & her family. Whew! It’OVER!!! This last biggie is DONE! So glad things are going well!! Blessings to your sweet family. Thanks Alan! I am heading to the airport soon to pick Mark up. Thanks for letting him be there with you! Give Jenny my love. Did you notice that the page your pastor shared has “5” at the top…. And this is Jenny’s 5th surgery. No coincidence, my friend. Great updates, Alan. Thinking of you guys so much. Prayers for fast recovery. Love you guys. Hug my precious Jen Bug for me! You have been cradled in my prayers all day long – – knowing it was going to be a loooong one! The last big surgery!!! Whoo Hoo!!! Thank you so much for keeping us all posted. We continue to pray for less pain, fast healing, and the love of God to continue to enfold you. You have both been cradled in my prayers all day — knowing it was going to be a loooong one! Thanks so much for the update. Last big surgery – Whoo Hoo!! Wish I was there!! So glad it’s over. Next step…healing. Love you guys! I appreciate your thorough updates, Alan! It sounds like you a have a wonderful pastor. I’ve heard many good things about him from Jenny as well. Continued prayers for a speedy recovery!